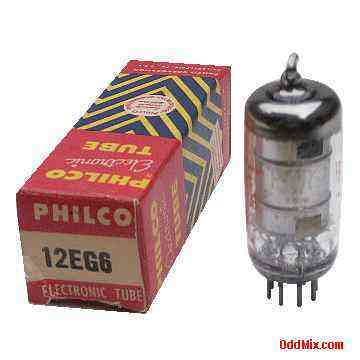 This is a genuine, vintage, Philco 12EG6 Pentagrid Converter electron tube. These low B+ voltage tubes were used as converter in superheterodyne circuits, mixer oscillators in automotive receivers and special low voltage circuits. These miniature, lightweight, portable, compact, tubes were developed to work with the automobile 12 Volt battery as anode supply. Useful for antique car and other radio restoration projects or to set up a private vacuum tube museum. It is a NOS tube - new old stock, unused, boxed, excellent condition.